We live in a society with a growing elderly population and a young population in which extreme sports and high-speed motor transportation are popular; therefore, the incidence of these fractures is likely to increase. In young adults, most distal humerus fractures occur from high-energy trauma, sideswipe injuries, motor vehicle accidents, falls from heights, and gunshot wounds. In elderly persons with more osteoporotic bone, most of these injuries occur from falls. Numerous classification schemes have been devised to categorize and discuss supracondylar fractures. In 1936, Reich originally classified these fractures into T and Y variations. In 1969, Riseborough and Raidin described four categories based on degree of displacement, comminution, and rotation. As surgeons became more adept at surgical reduction and internal fixation, the Arbeitsgemeinschaft für Osteosynthesefragen–Association for the Study of Internal Fixation (AO-ASIF) group described a classification based on fracture pattern and degree of comminution (see Classification). Surgical treatment of supracondylar fractures has evolved significantly over the past few decades. In the 1960s and 1970s, most surgeons condemned surgical treatment because of high failure rates with loss of fixation, nonunion, and elbow stiffness. 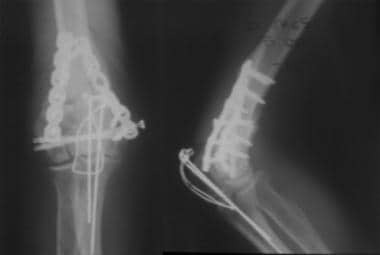 The "bag of bones" treatment was used when bone quality or fracture pattern was not sufficient to gain stable fixation. This led to generally poor and unpredictable results. In the 1970s, treatment began to shift from casting and the "bag of bones" technique to surgical intervention with limited internal fixation. Again, results generally were poor, owing to lack of adequate stabilization for early motion. In the early 1980s, the AO-ASIF group reported good and excellent results in 27 of 39 patients with comminuted fractures of the distal humerus. These by far were the best results reported in the treatment of these difficult fractures at that time. This led to an increased enthusiasm for surgical reduction and fixation. Additional surgical approaches were developed, along with more versatile fixation hardware, leading to improved surgical results. The "bag of bones" approach has now largely been replaced by total elbow arthroplasty, allowing improved and more predictable results. 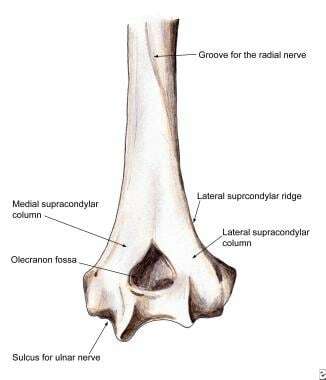 Supracondylar humerus fractures: anatomy. Trochlea rests in 6-8º valgus in relation to humeral shaft. Supracondylar humerus fractures: anatomy. When viewed on end, trochlea resembles spool. Functionally, the elbow joint behaves as a constrained hinge. The olecranon of the ulna articulates around the trochlea of the humerus. 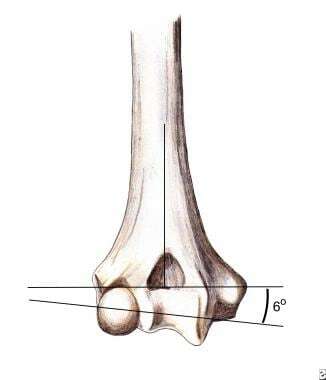 The trochlea normally is tilted in 4° of valgus in males and 8° of valgus in females, thus creating the carrying angle of the elbow. The trochlea also is externally rotated 3-8° from a line connecting the medial and lateral epicondyles, resulting in external rotation of the arm when the elbow is flexed 90°. A second plane of motion occurs with the elbow joint in supination and the forearm in pronation; this range of motion is allowed by the radial head articulation with the capitellum and the ulnar notch. The surgical anatomy closely mirrors the functional anatomy. For stable elbow motion, the trochlea must be restored to its normal position, acting as a tie rod between the medial and lateral columns of the distal humerus. This forms the triangle of the distal humerus, which is crucial for stable elbow function (see the image below). Supracondylar humerus fractures: anatomy. Note medial and lateral columns, connected by trochlea, thus forming triangle of distal humerus. Also note location of sulcus for ulnar nerve in relation to placement of medial plate, as well as location of radial nerve sulcus in relation to proximal placement of plates. Both columns must be securely attached to the trochlea. Every attempt should be made to restore the proper valgus tilt and external rotation of the trochlea so as to achieve stability, full motion, and a normal carrying angle. The coronoid is important to elbow stability and should be reduced and fixated if displaced. The olecranon fossa, a very thin wafer of bone, does not require restoration if badly comminuted. 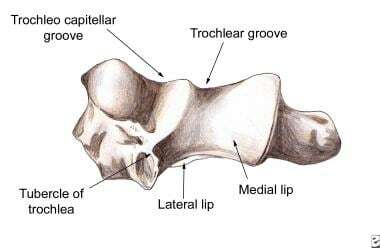 If the medial and lateral columns can be securely fixated to the trochlea, early motion should be tolerated. The medial column diverges from the humeral shaft at approximately 45°, continues, and ends in the medial epicondyle. Because nothing articulates with the anteromedial epicondyle, the entire surface is available for internal fixation hardware. Care must be taken to protect and transfer the ulnar nerve anteriorly. The lateral column diverges from the humeral shaft at approximately 20° and is largely cortical bone with a broad flat posterior surface; thus, it is ideal for plate placement. At the posterior capitellum, cancellous screws must be used to avoid interrupting the anterior capitellar cartilage. Biomechanical studies have demonstrated the strongest construct of fixation of bicondylar fractures to be a direct medial plate and posterolateral plate with screws directed at 90° angles. This provides the varus and valgus rotational stability to the construct, thus allowing early range of motion. The mechanism by which supracondylar humerus fractures occur has been a topic of debate. Historically, the mechanism has been accepted to be an axial load on the elbow, with the olecranon acting as a wedge splitting the medial and lateral columns of the distal humerus. However, mechanical studies performed on cadavers have shown that supracondylar (bicolumn) fractures are more likely to be produced with the elbow flexed beyond 90°. The fracture pattern is related to the degree of elbow flexion and the direction and magnitude of the force applied. Bicolumn fractures are far more common distal humerus fractures. In some reports, these account for as many as 70% of distal humerus fractures in adults. These fractures involve disruption of both the medial and the lateral column, thus disrupting the humeral triangle and resulting in disassociation of the articular surface from the humeral shaft. Successful treatment is most challenging in these fractures. Outcomes have improved dramatically over the past few decades as surgical technique and instrumentation have improved. Nevertheless, these patients must be informed early in their evaluation that the elbow probably will never be normal. The goal is to provide a comfortable elbow that functions as near to normally as possible. Most activities of daily living require a flexion range of 30-130°, which allows eating and personal hygiene. Compensating for lack of extension will be easier than compensating for lack of flexion, and compensating for lack of pronation will be easier than compensating for lack of supination. The final motion achieved appears to be related to the degree of initial trauma energy and to successful restoration of stability allowing early range of motion (ROM). High-energy trauma (eg, gunshot wounds, sideswipe injuries, or injuries from motor vehicle accidents) results in more soft-tissue damage and increased scarring, which is more likely to result in restricted ROM. Some reports indicate that capsular release performed at the time of initial fixation for these high-energy distal humerus fractures improves the long-term ROM. Flexion usually returns first, within 2-4 months, and final extension may progress up to 12 months after the injury. Use of dynamic extension splints in gaining final extension has been shown to be of some benefit. Numerous outcome evaluation schemes are available, but in low-energy trauma, a successful outcome is generally considered to be a 15-140° arc of motion with full supination and pronation and no pain or minimal pain. In high-energy trauma, these results are more difficult to obtain. Activity-related pain is present in approximately 25% of patients; however, it does not appear to be directly correlated with the amount of initial energy of trauma or with final ROM. Radiographs of type 3C distal humerus fracture 5 months after injury and fixation using olecranon osteotomy approach and medial and posterolateral plates. Range of motion, 10-140º without pain. Ilyas AM, Jupiter JB. Treatment of distal humerus fractures. Acta Chir Orthop Traumatol Cech. 2008 Feb. 75(1):6-15. [Medline]. Pollock JW, Faber KJ, Athwal GS. Distal humerus fractures. Orthop Clin North Am. 2008 Apr. 39(2):187-200, vi. [Medline]. Wong AS, Baratz ME. Elbow fractures: distal humerus. J Hand Surg [Am]. 2009 Jan. 34(1):176-90. [Medline]. Reich RS. Treatment of intercondylar fractures of the elbow by means of traction. J Bone Joint Surg Am. 1936. 18:997-1004. Milch H. Fractures and fracture-dislocation of the humeral condyles. J Trauma. 1964. 4:592-607. Farley FA, Patel P, Craig CL, Blakemore LC, Hensinger RN, Zhang L, et al. Pediatric supracondylar humerus fractures: treatment by type of orthopedic surgeon. J Child Orthop. 2008 Mar. 2(2):91-5. [Medline]. [Full Text]. Pescatori E, Memeo A, Brivio A, Trapletti A, Camurri S, Pedretti L, et al. Supracondylar humerus fractures in children: a comparison of experiences. J Pediatr Orthop B. 2011 Dec 26. [Medline]. Mehne DK, Matta J. Bicolumn fractures of the adult humerus. Presented at: The 53rd Annual Meeting of the American Academy of Orthopaedic Surgeons. 1986. New Orleans, La. Silva M, Pandarinath R, Farng E, Park S, Caneda C, Fong YJ, et al. Inter- and intra-observer reliability of the Baumann angle of the humerus in children with supracondylar humeral fractures. Int Orthop. 2009 May 8. [Medline]. Heal J, Bould M, Livingstone J, Blewitt N, Blom AW. Reproducibility of the Gartland classification for supracondylar humeral fractures in children. J Orthop Surg (Hong Kong). 2007 Apr. 15(1):12-4. [Medline]. Athwal GS, Goetz TJ, Pollock JW, Faber KJ. Prosthetic replacement for distal humerus fractures. Orthop Clin North Am. 2008 Apr. 39(2):201-12, vi. [Medline]. Reising K, Schmal H, Kohr M, Kuminack K, Südkamp NP, Strohm PC. Surgical Treatment of Supracondylar Humerus Fractures in Children. Acta Chir Orthop Traumatol Cech. 2011. 78(6):519-523. [Medline]. Hoppenfeld S, deBoer P. Surgical Exposures in Orthopaedics: The Anatomic Approach. 3rd ed. Philadelphia: Lippincott Williams & Wilkins; 2003. Moon JG, Lee JH. Orthogonal versus parallel plating for distal humeral fractures. Clin Shoulder Elbow. 2015 June. 18 (2):105-12. [Full Text]. Goel DP, Pike JM, Athwal GS. Open reduction and internal fixation of distal humerus fractures. Operat Techn Orthop. 2010 Mar. 20 (1):24-33. Got C, Shuck J, Biercevicz A, Paller D, Mulcahey M, Zimmermann M, et al. Biomechanical comparison of parallel versus 90-90 plating of bicolumn distal humerus fractures with intra-articular comminution. J Hand Surg Am. 2012 Dec. 37 (12):2512-8. [Medline]. Schwartz A, Oka R, Odell T, Mahar A. Biomechanical comparison of two different periarticular plating systems for stabilization of complex distal humerus fractures. Clin Biomech (Bristol, Avon). 2006 Nov. 21 (9):950-5. [Medline]. Stoffel K, Cunneen S, Morgan R, Nicholls R, Stachowiak G. Comparative stability of perpendicular versus parallel double-locking plating systems in osteoporotic comminuted distal humerus fractures. J Orthop Res. 2008 Jun. 26 (6):778-84. [Medline]. [Full Text]. Schuster I, Korner J, Arzdorf M, Schwieger K, Diederichs G, Linke B. Mechanical comparison in cadaver specimens of three different 90-degree double-plate osteosyntheses for simulated C2-type distal humerus fractures with varying bone densities. J Orthop Trauma. 2008 Feb. 22 (2):113-20. [Medline]. Shin SJ, Sohn HS, Do NH. A clinical comparison of two different double plating methods for intraarticular distal humerus fractures. J Shoulder Elbow Surg. 2010 Jan. 19 (1):2-9. [Medline]. Joiner ER, Skaggs DL, Arkader A, Andras LM, Lightdale-Miric NR, Pace JL, et al. Iatrogenic nerve injuries in the treatment of supracondylar humerus fractures: are we really just missing nerve injuries on preoperative examination?. J Pediatr Orthop. 2014 Jun. 34(4):388-92. [Medline]. Jupiter JB. Complex fractures of the distal part of the humerus and associated complications. J Bone Joint Surg Am. 1994 Aug 1. 76 (8):1252-64. Södergård J, Sandelin J, Böstman O. Postoperative complications of distal humeral fractures. 27/96 adults followed up for 6 (2-10) years. Acta Orthop Scand. 1992 Feb. 63 (1):85-9. [Medline]. McKee MD, Wilson TL, Winston L, Schemitsch EH, Richards RR. Functional outcome following surgical treatment of intra-articular distal humeral fractures through a posterior approach. J Bone Joint Surg Am. 2000 Dec. 82-A (12):1701-7. [Medline]. Incision is made along proximal 5 cm of medial ulnar border, curving to medial side of olecranon and returning to midline posteriorly to approximately 15-20 cm above elbow joint. Nerve is traced distally and released from cubital tunnel and into flexor muscle mass; care is taken to avoid motor branch to flexor carpi ulnaris. Articular branches need to be sacrificed for later anterior transposition. Nerve then is carefully retracted and protected with vascular tape. Cut is made with oscillating saw and completed with sharp osteotome to prevent damage to articular surfaces. Gauze sponge can be inserted into joint prior to osteotomy completion to further protect articular cartilage. Olecranon, with intact triceps insertion, is reflected posteriorly and covered with moist sponge, allowing easy access to entire supracondylar and to joint surfaces. Between postoperative days 10 and 14, sutures are removed. If wound is stable, patient is placed in hinged elbow orthoses, and protected active range of motion is allowed. Passive assisted range of motion is allowed to point of discomfort, not pain. Importance of early range of motion to final outcome is well documented. Orthosis is worn until evidence (both clinical and radiographic) of fracture union is present, and then orthosis use is discontinued. This usually occurs 6-12 weeks postoperatively.